When you’re designing digital storyboards, you should be able to take advantage of every feature in order to get your vision out to the right people. With Storyboard Quick 6, it’s easier than ever to show off your work! 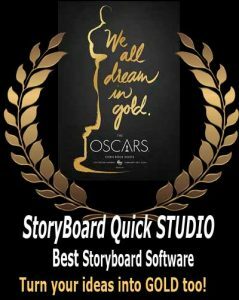 This lightning-fast, cutting-edge program offers so many benefits, including the ability to print your storyboard and then export them as graphic files – or even a Flash movie! 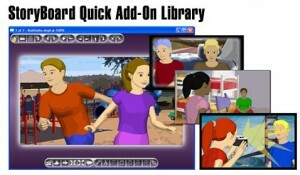 StoryBoard Quick 6 software makes sharing your vision so simple and cost-effective. This superb program offers a new, script-integrated page layout that provides you with script formatting (with thumbnail shots). Going viral with your project ideas and putting them in front of the people who matter most can be as easy as pushing a button with StoryBoard Quick 6! One of the key features of this program is its ability to remove the artist from the equation. By offering a wide range of pre-loaded characters, props, and special effects, you can avoid expensive outsourcing and the drama it so often brings with it…forever! Instead of endless meetings with artists, and all the delays and missed deadlines that usually result, you can streamline your process, which will boost your productivity and keep you on schedule. If you’re looking for the best way to get your storyboards ready to film, this is it! There’s no faster, more affordable way to make it happen! Our software is also designed to work with the programs and processes you already know and love. 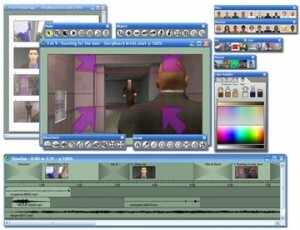 This familiarity and user-friendliness provides you, the director, with a much more pleasant and smooth storyboarding experience. You’ll be amazed by how easily you can import a wide array of images, photos, and text right into your digital storyboards! Drag and drop them exactly where you want them, and then import your script information and scheduling data. It’s also possible to type directly into a caption area on the screen. Obviously, this sort of intuitive interface allows for a lot more creativity, in a much shorter time frame! If you’re looking for ways to trim the costs of your next project, look no further! Refining your storyboarding process is the first, crucial step towards getting the word out to a bigger audience. With the many capabilities of PowerProduction’s cutting-edge software, you can make it all happen, in less time…for much less money!